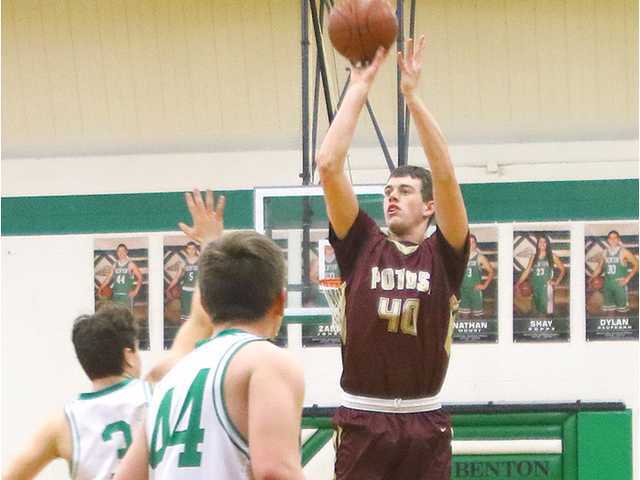 Senior Nick Edge scored a team-high 16 points in Potosi’s 66–51 Six Rivers West victory at Benton Thursday night. With the win, the Chieftains clinched the outright league title. POSTED February 27, 2019 1:00 p.m.
BENTON — Winning back-to-back conference titles is no small feat, but that didn’t stop the Potosi Chieftains from doing just that, with a Six Rivers West conference title last season, and another one this year. Coach Mike Uppena’s Chieftains closed out the regular season last Thursday night with a league record of 11–1 after a scoring a 66–51 road win at Benton. The Zephyrs (15–7, 9–3) were hoping for a share of the title, as a win over Potosi would have made for a three-way tie that would have included Shullsburg (18–4, 10–2). For coach Uppena, it is his third conference title in 17 seasons at Potosi, the first coming in 2012–13. “It’s never east to go back-to-back, every conference championship is tough,” said Uppena. The Potosi boys had already wrapped up a share of the conference title the week before with their win over Cassville, but like last season, the Chieftains didn’t want to share this year’s title either. “Our boys were hungry for that game Thursday night, and they wanted it. That was goal No. 1 at the beginning of the season,” Uppena reiterated. The Chieftains controlled the first half and held a 30–22 lead at intermission, then overcame a little run by Benton in the second half to secure the victory and the outright conference title. As a team, Potosi knocked down 26 of 55 (47 percent) shot attempts, including 3 of 13 (23 percent) from 3-point range. They were 11 of 13 (85 percent) from the free throw line, committed 11 turnovers and were out-rebounded, 32–31, by the Zephyrs. Junior Nick Edge led the Chieftains with 16 points and two blocked shots, while senior Brady Curtis chipped in 14 points and five rebounds. Fellow senior Ethan Groom finished with 10 points and five boards, while junior Ryan Kruser added nine points, to go along with a team-high four assists and three steals. Ben Udelhofen and Will Bierman each pulled down five rebounds. After accomplishing their first goal of the season with a conference title, it’s on to their next goal, which started this past Tuesday night in the WIAA Division 5 regional tournament. The second-seeded Chieftains hosted No. 15 seed Belmont (2–20) this past Tuesday night, with the winner advancing to face either Seneca (14–6) or North Crawford (9–12) Friday night. Potosi (17–4, 11–1) — Ben Udelhofen 8, Will Bierman 5, Brady Curtis 14, Jaydon Carbone 2, Ryan Kruser 9, Ty Dressler 2, Ethan Groom 10, Nick Edge 16. Totals – 26-55 11-13 66. Benton (15–7, 9–3) — Will Lawrence 6, Nathan Mowry 12, Nick Jansen 12, Brooks Tiedman 19, Wyatt Bastian 2. Totals – 19 8-13 51. 3-point goals — P: 3 (Bierman 1, Curtis 1, Kruser 1), B: 5 (Mowry 1, Jansen 4). Total fouls – P: 17, B: 11. Fouled out – B: Bastian.